Hope Street Predicts Residential Rental Rates in Alberta to Rise in 2019. » Hope Street Real Estate Corp.
Hope Street Predicts Residential Rental Rates in Alberta to Rise in 2019. Landlords optimistic as Alberta rental rates show signs of life. Recent data suggests that rock bottom rental rates in Alberta’s major centres appear to be on the rise, indicating a shift from the province’s depressed market position. 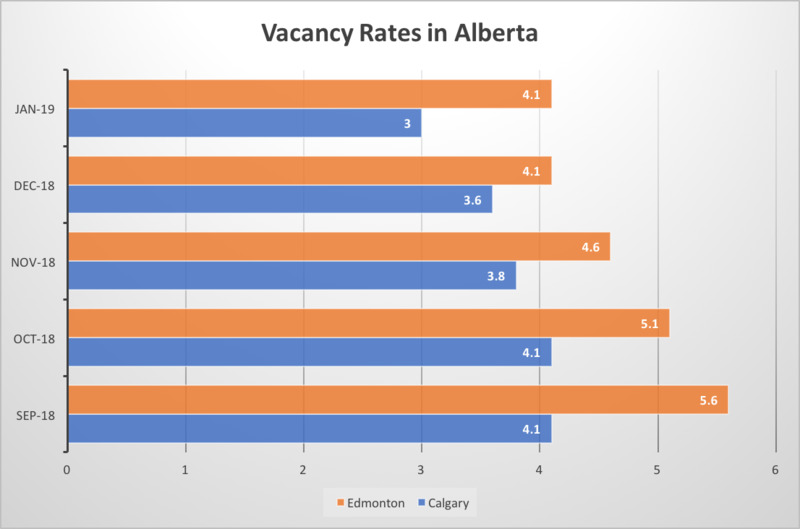 The rental markets of Alberta’s major centres have seen drastic rate declines and record high vacancy rates in the past 36 - 48 months. Recent data compiled by the writer from proprietary operational data and ongoing analysis from partnering ILS (Internet Listing Service) websites suggests that this depressed state appears to be in recovery as rental rates show signs of growth, and vacancy rates show signs of decline. The average rental rate, blended for all types of advertised rental homes and condos in the metro Calgary region, was $1671 per month at the January 15th, 2019 dataset. This amount represents a 13% rise in the past 5 months, as the average rental rate in September 2018 was $1481. 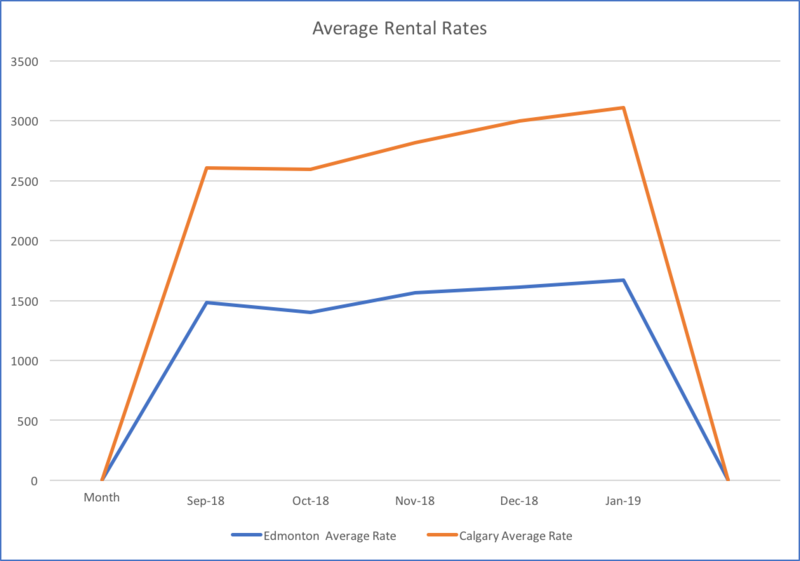 The average rental rate, similarly blended for all types of advertised rental homes and condos in the metro Edmonton region, was $1368 per month at the January 15th 2019 dataset. This amount represents a 21% rise over the past 5 months, as the average rental rate in September 2018 was $1126. Private landlords in Alberta have endured a rough ride over the past few years, rental rates have dropped while vacancy rates had increased. Leading indicators suggest that there is cause for optimism in 2019 as the January data continues to suggest stagnant rental rates are on the rise. Additionally, and in support of this trend, vacancy rates for private rental homes appear to be in decline and show similar trends of decrease in support of the rate data. The average vacancy rate observed by private landlords, blended for all types of rental homes and condos in the metro Calgary region, was 3.0% at the January 15th 2019 dataset. This represents a full 1.3% decrease in the past 5 months as the average vacancy rate in September of 2018 was 4.3%. The average vacancy rate observed by private landlords, blended for all types of rental homes and condos in the metro Edmonton region, was 4.1% at the January 15th 2019 dataset. This represents a full 1.5% decrease in the past 5 months as the average vacancy rate in September of 2018 was 5.6%. …the feedback from our renters seems to suggest that there are several factors at play to cause a market shift, these factors include: an increase in demand due to considerably tougher mortgage lending rules, a bottoming out of rental market pricing, and less new rental housing coming online. Landlords have reason to be optimistic for the coming year. The statistics contained in this report are primarily focused on rental data from private landlords. For the purposes of this report; “private” landlords may be defined as persons who own 1 - 3 residential rental properties which may include some portion of their primary residence such as a laneway suite, basement rental apartment, etc. The private landlord does not employ any other person in a conventional employee relationship wherein payroll deductions are made and a bonafide property management job description exists. Conversely, the private landlords surveyed overwhelmingly hold outside, full time, employment and treat their real estate investing as a part-time pursuit. This report was compiled by the team at Hope Street Management Corporation and was primarily based on raw data from Hope Street’s rental operations in the past 150+ days, data from cooperating ILS (Internet Listing Service) websites, interviews with stakeholders, and anecdotal data. Hope Street is an industry leading team of property management professionals currently serving the Edmonton, Calgary, and Vancouver markets. Hope Street has 50 team members and directly manages the tenancies of about 3600 people.